After years of paralysis, the one thing Jan Scheuermann wanted was to feed herself. Now, thanks to a mind-controlled robotic arm, Scheuermann has done just that. Stricken with spinocerebellar degeneration since 1996, Sheuermann, 52, has progressively lost control of all motor function from the neck down. By implanting two quarter-inch-by-quarter-inch electrodes in her brain and connecting them to a sophisticated robotic arm, researchers at the University of Pittsburgh School of Medicine and University of Pittsburgh Medical Center have allowed the mother of two to manipulate objects by using only her thoughts through a brain-computer interface, or BCI. Before the surgery that connected some 96 electrode prongs in her brain, the Pennsylvania woman told researchers she wanted to do something very specific if all went well. "They asked me if there was something special I wanted to do," Sheuermann said. "And I said my goal is to feed myself a bar of chocolate. And I did that today." With the help of the robot arm, which she named Hector, Scheuermann fed herself for the first time in eight years. 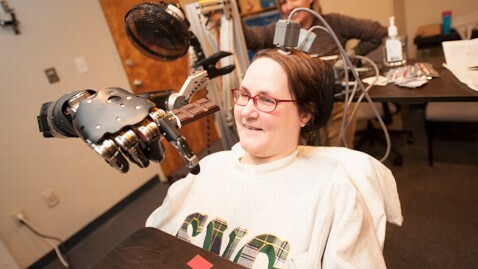 Quadriplegics like Scheuermann have manipulated robotic arms using BCI before. A 58-year-old stroke victim was able to sip a cinnamon latte using her thoughts and a mechanical arm in a Brown University study last spring. The same Pittsburgh researchers used a less sophisticated technology last year to help a paralyzed man control a robotic arm in three dimensions. "With three degrees of control, you can do things like manipulate a computer screen and that gentleman was able to reach out and touch his daughter," Dr. Michael Boninger of the University of Pittsburgh told ABC News. "But to actually manipulate objects, to feed yourself for example, you need more than those three dimensions of control. That's what makes Jan so remarkable." Boninger, who is one of the senior investigators in the study that was published in The Lancet in December, said Sheuermann had seven degrees of control with her robotic arm and that's what has allowed her to perform complicated tasks like feeding herself chocolate. "The biggest change," Boninger said, "is the sophistication with which we've learned to interpret electrical activity in the brain." Boninger said the software has improved by a "quantum leap" and expects the technology to continue improving until one day a quadriplegic like Sheuermann will be able to leave the lab with their mind-controlled arm and use it in their everyday life. "I wouldn't say we have decoded the brain," Boninger said. "But we are getting closer. We can't read emotions but we can interpret motions the brain wants the body to make." As for Sheuermann, she will continue to participate in Boninger and his colleagues' BCI research. Though the electrodes will eventually be taken out of her brain and her time in the study will come to an end, Sheuermann said she has enjoyed every moment of it. "For me, it's been one of the most exciting endeavors I have ever undertaken," Sheuermann wrote on the University of Pittsburgh Medical Center blog. "Being with a team of scientists and using cutting-edge technology that makes me the only person in the world who can scratch her nose with a robotic arm, well, that's thrilling."